Jeff, can you tell me about what your company does and a basic overview of your products? 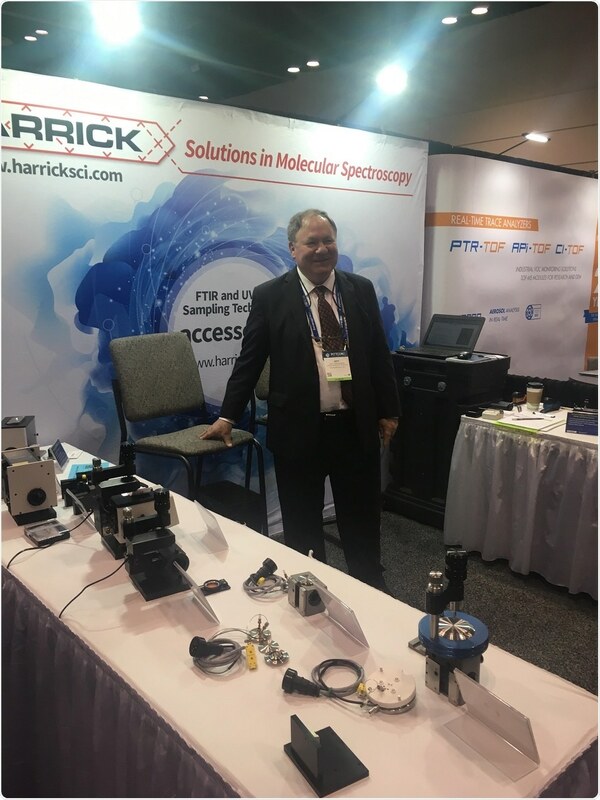 Harrick Scientific is a manufacturer of accessories that are used in the spectrometers to help the spectrometer gain information it otherwise couldn't obtain. Harrick was the original pioneer and developer of Attenuated Total Reflectives (ATR), a very commonly used method for analyzing a wide variety of materials. It now is the most widely used technique in Fourier-transform infrared spectrometry. That was the start of the company. We have a wide array of accessories that are used with spectrometers from manufacturers including Thermo Fisher Scientific, Bruker, Shimadzu, Agilent Technologies and others. We don't make spectrometers- we make spectrometers better. We give it the ability to obtain information it otherwise couldn't. Transmission, the classic method of sampling was simple. A source of light goes through a sample and you measure the absorption. There are many other techniques of reflection that enable you to look at all kinds of materials that you never could see before with the classic transmission technique. Regarding the life sciences, we have a particular Attenuated Total Reflectives (ATR), accessory - a multiple reflection ATR- that has become very valuable and important in some protein studies, particularly protein folding, protein sheets and aqueous protein solutions. That's one of our solutions in the area of bio-sciences. Another one is an accessory is called the GATR, which stands for Grazing Angle ATR. This looks at one layer of molecules, a molecular mono-layer, which is extremely thin. Unlike a macro sample which can be massive and very deep, a mono-layer is one thin layer of molecules and that comes into play for bio-membrane related research and development. We also produce ATR with an integrated video camera. This has been used, for example, to study catheters to make sure the catheter surface is inured and doesn't cause any immune response in the human body. There's a company named Semprus Biosystems in Cambridge, Massachusets that uses the video version. It's like a microscope only more compact and economical, and they use that to check for any surface issues that might occur due to an immune response to something on the surface. Those are the basic areas of bio-science that we get involved in. What are the applications of these? Companies want to develop catalysts to help make chemical reactions more efficient. Catalysts are also involved in development of fuels of the future, so there's all kinds of work being done using this diffuse reflection equipment with high temperature reaction chambers. This can reach over 900 degrees celsius under large pressures to simulate a reaction that would get scaled up into an industrial plant. In a lot industrial processes, catalysts help reduce the amount of energy it takes to manufacture. Catalysis researchers, fuel researchers, and material scientists would be the kinds of people who find this equipment to be very useful and valuable. What types of people do you want to come and visit your booth today? People in catalysis research, fuel research, some bio-science and polymer people, chemical manufacturers, academicse, professors, graduate students, and anybody who needs to study the composition of materials. Why are you at Pittcon? For the fun of it. We're here to show what we have to offer to the scientific community to help them solve problems. I enjoy my job!